It took Apple three product generations to correct the problems with the newest version of its MacBook Pro. Three long years during which even the most committed macOS users were reticent to continue updating their hardware. Fortunately, the 2018 version of the MacBook Pro more than makes up for its predecessors’ shortcomings. Building a good product is within the reach of most manufacturers these days. In 2018, most of the technological tools at the disposal of the general public (computers, smartphones, tablets) are both affordable and of good quality. However, there is a difference between making a good-quality product and a desirable product – an object that has been so well conceived, that is so enjoyable to use, and that is so efficient, that it cries out “use me!” every time you see it. An object that you long for when you are not using it and that you always enjoy using – regardless of the task you are performing. I have only come across such a device a few times in my life, but, since every time was special, I remember each one… a SteelSeries mousepad, my first SSD drive, my first iPhone (and all of my following iPhones), Apple’s Magic TrackPad, Logitech’s MX series mice (which became the G series), my Bose QC 35 headphones, and, of course, my MacBook Air. Despite the fact that it is getting on in years, that its display is almost prehistoric, that its configuration is far from being modern, that it lacks up-to-date ports, that it has a small trackpad, and that it is rather thick (compared to more modern devices), the MacBook Air still remains my favorite portable computer because of its durability, versatility, and keyboard – which is neither too old nor too modern. Or should I say, it used to be my favorite portable computer? After two generations of releasing what could only be called “decent” MacBook Pros (which left much room for improvement), Apple has finally got it right. The 2018 MacBook Pro is truly excellence reinvented… let’s see why. Apple’s designers really know what they are doing. 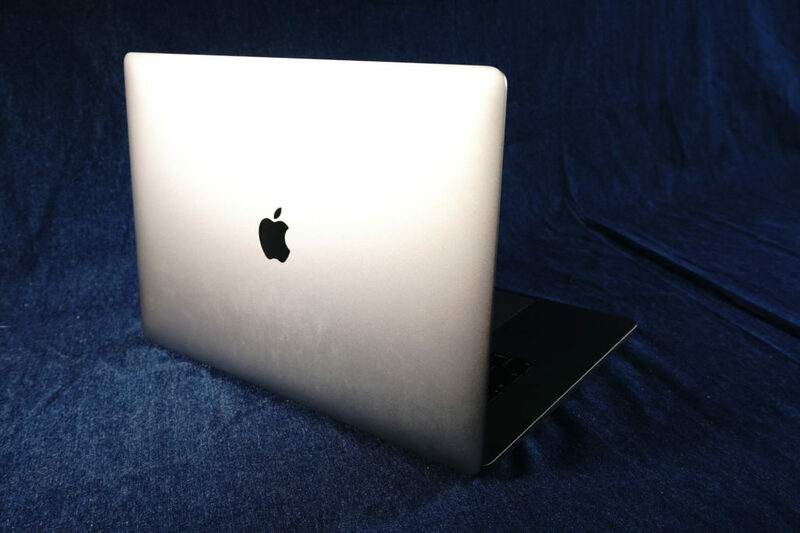 Since 2016, the MacBook Pro has adopted a new streamlined aesthetic (which can even be seen on its illuminated Apple logo). Nothing has changed in this respect on the 2018 version, the proportions of which are perfect; its black borders are thin enough not to be bothersome but thick enough to make its display stand out from the rest of the computer (which is not the case on true borderless computers). The materials used in this computer’s construction are of high quality and all of its finer details are millimetrically precise. 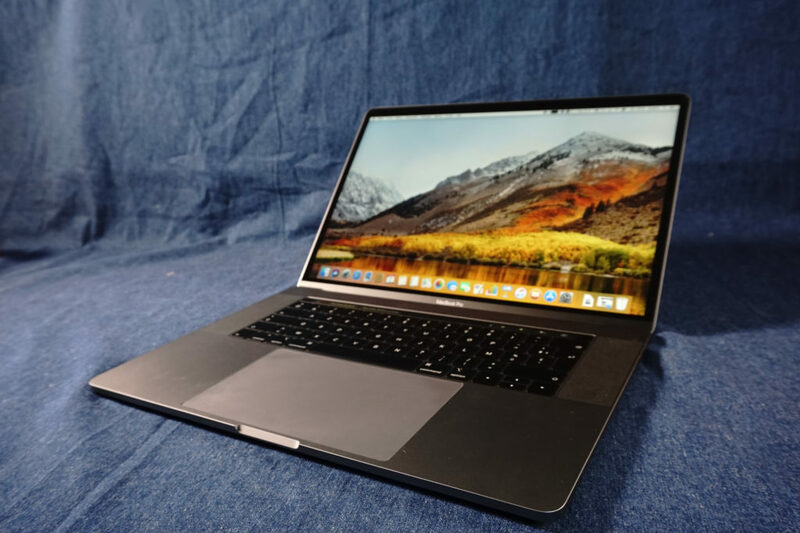 Even the largest version of the MacBook Pro (15-inch display, Intel Core i9, 32 GB of RAM, 4 TB of SSD storage, 10 hours of battery autonomy) remains extremely thin-profiled and lightweight (1.55 cm, 1.8 kg). The end result is an easily transportable and powerful portable computer – a rare combination (since the additional cooling required by powerful computers often results in greater thickness). While Apple’s computer is not the thinnest in the world, all of its components are well-balanced. The problems related to the overheating of its Core i9 processor have been corrected by a recent software update (nevertheless, the decision to use this processor in the first place remains difficult to justify – especially given its high cost). Thanks to its 4 USB-C Thunderbolt 3 ports, the 2018 MacBook Pro can be used to create a comprehensive and powerful workstation. 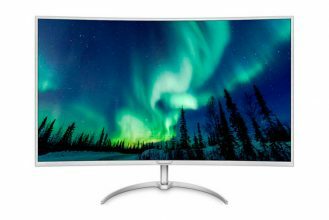 It can be connected to up to two 5K 60Hz displays or up to four 4K 60Hz displays. You could also set up a more modest workstation consisting of an external GPU, two displays, a USB-C to USB A and SD hub, and a NAS device for extra storage (connected to your remaining port). 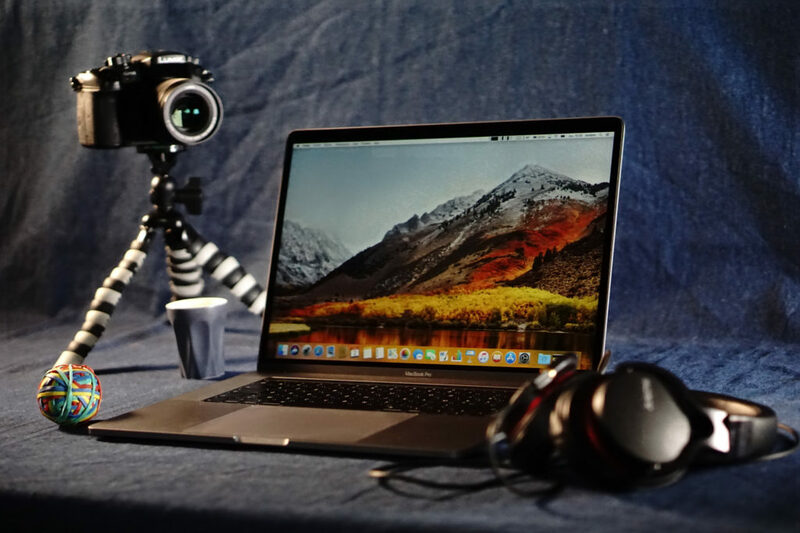 In short, Apple has put the Pro back in the MacBook Pro and it is hard to imagine any other computer being able to compete with it in terms of being used as a comprehensive and versatile mobile and desktop workstation. Having grown accustomed to the 2016 MacBook Pro’s 13-inch display, we were dreading that a larger computer would be harder to transport. However, we were pleasantly surprised by how easy this 15-inch computer is to transport – you almost forget that you are carrying it once you slip it into your bag or carrying case. When we tested the first generation of the new MacBook Pro, our two main complaints (which were serious enough to prevent someone from buying the computer altogether) concerned its keyboard and Touch Bar. A portable computer with a bad keyboard is like a smartphone with a laggy display or a car with a sticky steering wheel. You don’t really want to use it because every time that you do, you get annoyed. It’s even worse if you rely on the device in question as your main means of productivity. After two generations, Apple has pulled off a miracle. The 2018 MacBook Pro is both simple and beautiful. Its keyboard is also one of the best I have ever tested. It is less noisy than its predecessors, making it is less annoying when used in open spaces (or even in your own office; I was often annoyed by the 2016 version’s noisiness). But above all, it is infinitely more comfortable to type on. While its keys are very flat, they still have enough travel to provide a good amount of force feedback. The force applied to this keyboard is absorbed by its silicon covering which reduces noise while protecting the keyboard from dust; it also provides a softer sensation than the hard clicking of previous versions. In only two weeks of testing, it is hard to say for sure whether this keyboard is really more durable than the first two versions – the 2016 version started showing signs of weakness after only 6 to 7 months of use. What I can say is that I have rarely had such a pleasant typing experience – even though on my desktop computer I normally use an IBM Model M keyboard (which is pretty much the opposite in terms of noise level and key travel distance). The Touch Bar was the 2016 MacBook Pro’s other major shortcoming. This tactile bar is only found on Apple’s most expensive products (basically those that had a new version released in 2018) and replaces the function keys found on previous versions of the computer. 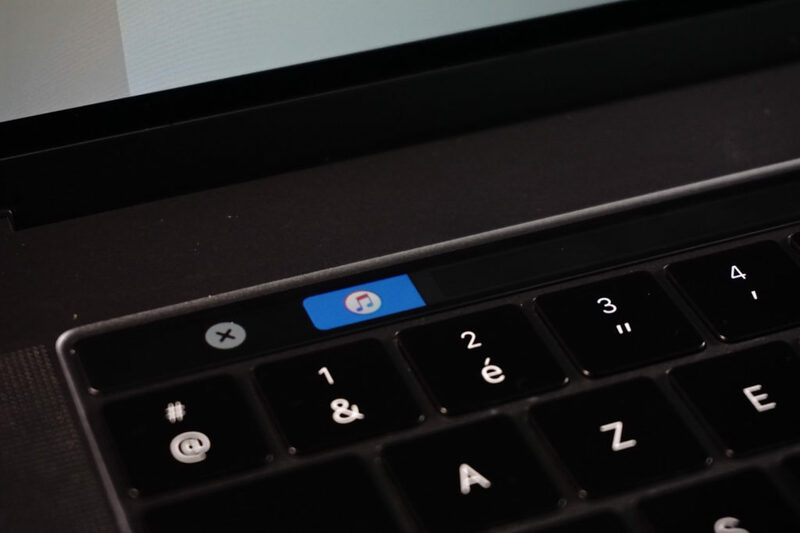 When the Touch Bar was first introduced, power users were not keen on giving up useful keyboard shortcuts in exchange for visual indicators that were not necessarily easy to reach. Nevertheless, two years later, thanks to its continued development, the Touch Bar finally makes sense. 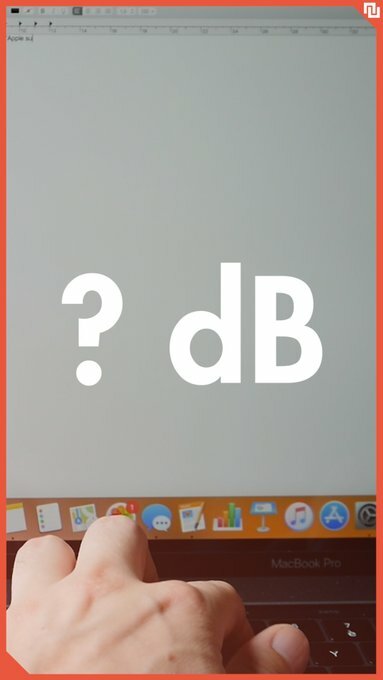 In reality, we use the Touch Bar on a daily basis without even noticing – proof that it has very naturally become an integral part of our workflow. Its function keys activate when they are needed and it is useful to be able to quickly adjust the computer’s display luminosity and audio volume. The Touch Bar really proves its worth when using image or video processing software. When using Affinity Photos, for example, every tool has functions associated with it, and you will often find yourself having to manage two functions simultaneously (for example, moving the eraser and adjusting the eraser’s size on the fly). When editing texts, the Touch Bar can be used almost instinctively for activating simple formatting options. Even though we were critical of the Touch Bar (which we originally perceived to be an expensive gadget that didn’t serve much of a purpose), on the 2018 MacBook Pro, the Touch Bar has finally become useful. All in all, you have to credit Apple for having come up with the idea for the Touch Bar and the developers who were able to render it useful. As far as this computer’s display and TrackPad are concerned, we will not spend time praising them as we did in 2016. Suffice it to say that the display on the newest version of the MacBook Pro has been further improved by the incorporation of True Tone technology (which adjusts the display’s colors in function of a room’s lighting), making it one of the best displays on the market. However, it may not be the best gaming display since it is limited to 60Hz. The MacBook Pro’s TrackPad is, simply put, lightyears ahead of anything offered by the competition. While this has been true of the last several generations of the MacBook Pro (Apple being the only manufacturer to truly master the fine art of multipoint tactile interfacing), the 2018 version’s TrackPad reaches new levels of excellence. It is large, slides very smoothly, and is extremely precise. Gestures involving two, three or four fingers are intuitive and resemble those found on a smartphone. It also incorporates 3D Touch technology which is able to detect when significant pressure is applied to the TrackPad in order to activate new gestures. Once again, we come back to a product’s desirability: after using the Magic TrackPad, no other trackpad will ever be able to live up to your expectations. 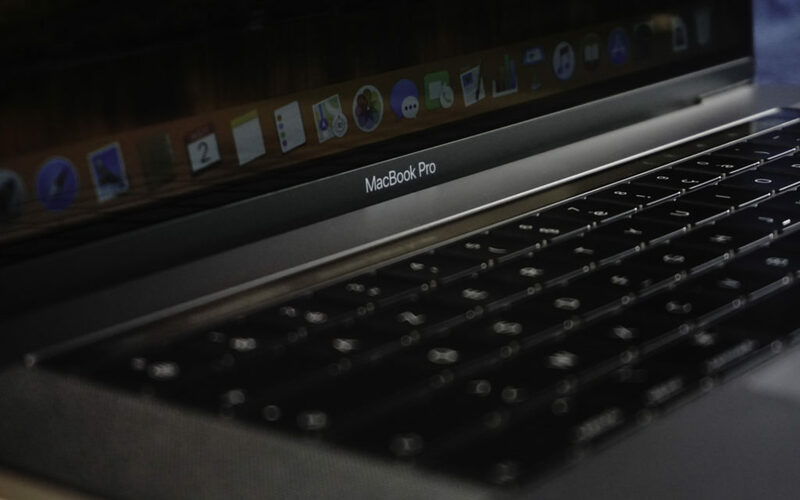 Because of its proprietary nature, Apple’s software is perfectly suited to its hardware and macOS aficionados will be happy to discover the latest version of Apple’s operating system. The beta version of macOS Mojave is highly stable on Apple’s newest hardware configurations as well as on older ones. As for the MacBook Pro’s exclusive reliance on USB-C connectivity, the debate sparked by this issue two years ago is becoming increasingly irrelevant; these days all of the necessary adapters can be purchased and the majority of Apple’s hardware is now compatible with this standard. However, Apple does not, by default, provide USB-C to Lightning cables or a USB-C cable to charge the Apple Watch… a problem which should be remedied as soon as possible. There were so many things that needed to be corrected in the last two years in order to transform the MacBook Pro into the reference computer it once was. But Apple finally got there. While it is common for Apple to take two generations in order to perfect one of its products, it took three generations for Apple’s new MacBook Pro to really come into its own. Two years ago we were recommending that people keep their older MacBook Pros, but that has all changed with the 2018 version which is the embodiment of power, elegance, and productivity – fully worth its price. Previous Nvidia RTX at a glance: Should I upgrade my graphics card? Next Fitbit Charge 2 vs Charge 3 Fitness Activity Tracker, what’s the difference?